What a tremendous find. We finally have an example of a shield from the 12th century that has not been modified like the shield of Arnold von Brienz. The article argues that the shield is almond-shaped shield which are sometimes represented in period art as being shorter than kite shields, yet the shield could well have been a kite shield with a more pointed top than is typical. Most of the text of the article is written in Polish; it would be great if someone from myArmoury would be willing to translate it into English. Besides the photo I have attached, the article also has a photograph, albeit one that is fairly poor in quality, showing the shield in situ at the archaeological dig site. In the year 2000, archaeological research was conducted in the northern part of Podzamcze in Szczecin, within Quarter 1, situated on the eastern side of Panieńska Street, near the town’s defensive walls with the Tower of Seven Coats (Polish: Baszta Siedmiu Płaszczy). Among numerous and diverse sources, there was a fragment of an almond-shaped shield, whose arched upper edge forms a characteristic point. Approximate size of the shield could be the following: height between 1.25 and 1.35 m, maximum width – 0.86 m. The frame of the shield without a boss was made of alder wood in plank construction, of one layer of six planks, 6.5 to 17 cm wide and 0.4 to 0.7 cm thick, butted together in a row, with edges touching each other. The front of the shield was covered with a colourful ornament, directly on the wooden surface. In the centre, there is a red-yellow stylised cross with expanding arms. The edge is bordered with an 8.5-10.5 cm wide “bordure” marked with a line made with a black paint. It is filled with repeated red circles and black ovals, inside which there are yellow rosettes on the red background. On the inner side of the shield, the left shield-grip made of a 42 cm long leather strap has been preserved. On the right side, the strap was most likely considerably shorter allowing for a firm grip. Almond-shaped shields were used in Europe from the end of the 10th to the 13th century The shield from Szczecin was found in the fill of the wood and earth rampart, which was dendro-dated to 1170-1197. Thus, the dating corresponds to the final period of use of this form of weapon. However, it is impossible to determine how the discussed item found its way to Szczecin. It appears today that it could be brought by Danish armies that besieged the town several times in the second half of the 12th century. A sketch with a hypothetical reconstruction of the strapping. It looks as though the shield is flat, or nearly so, with little indication of the commonly suspected deep curvature of the longer kites. I'm very curious as to whether or not there are any traces or evidence of covering or facing for the rear of the shield, or something semi-transparent for the face. What a find! The paper's Figure 6 really helps put it into perspective. Roland Warzecha of Dimicator has observed, if I recall correctly, that some manuscripts seem to show mostly flat kite shields, while others show curved ones. One might argue that the apparently flat shape of some shields arises from the distortion of perspective, yet we clearly see some manuscripts with deeply curved kites (e.g. some of the shields in the Hortus Deliciarum ) while others appear to have shallower curves. It stands to reason that some kites might have been quite flat; we certainly have evidence of this from some of the extant later heater shields. Mike Ruhala commented on the apparent lack of facing in a Facebook discussion of the shield. I can't comment upon whether the shield has traces of the facing left; Mike even suggested the shield may not have been intended for combat. As I observed, later 11th century and 12th century ceremonial objects, like the Reichsschwert of Vienna, seem to have relatively few differences between them and tools clearly intended for war. Even if this shield is ceremonial, I suspect it will provide us with a good indication of what war shields were like from the time. "Nie wiadomo również, czy tarcza nie była pierwotnie łukowato wygięta, a dopiero na skutek procesów podepozycyjnych uległa spłaszczeniu." 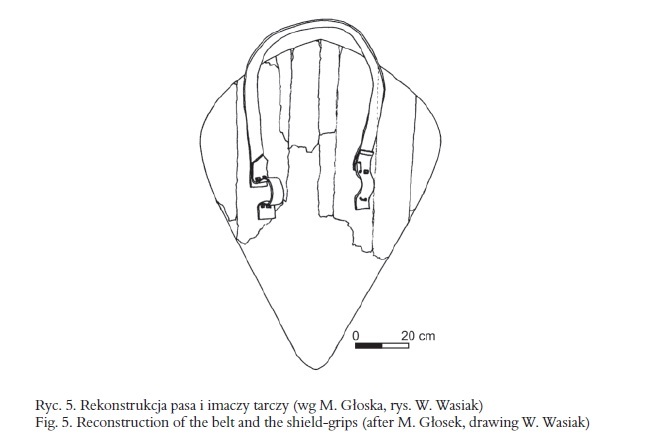 My crude translation would be (I should note that my Polish is not so good):"It is also hard to say if the shield was curved originally, and had been flattened only later as a result of pressure processes." Authors are also discussing possible use of the shield (p. 274) stating again, that without any facing / reinforcement, the shield would have little combat qualities - while the above-mentioned shield from Illerup Ådal had comparable thickness, a similar shield from Seedorf was twice as thick. Thus, the Szczecin shield could have been used as a decorative item, for example in the knights' hall."